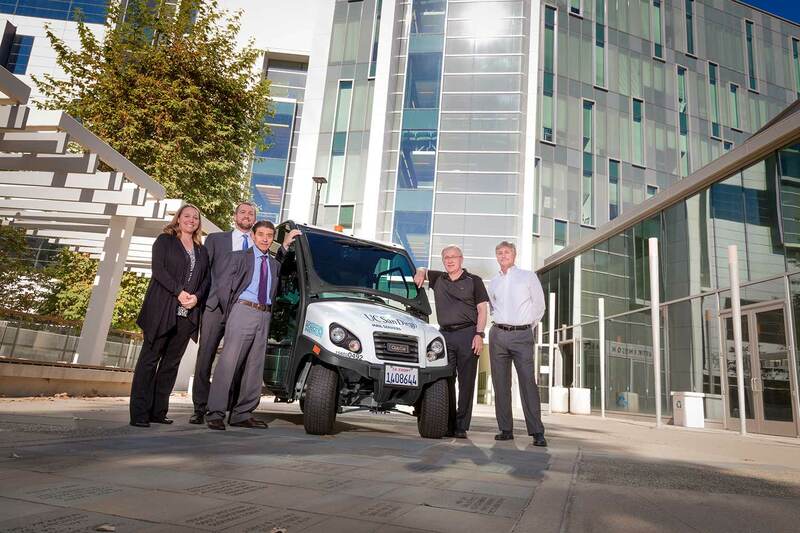 From left: Gisella Higgins, director of logistics; Jonathan Heinlein, associate director, business contracts; Frederico Gomez, manager, Mail Services--all three are part of the Integrated Procure-to-Pay Solutions unit on campus; and Henrik Christensen, director and Todd Hylton, executive director, Contextual Robotics Institute at UC San Diego. Maps combining real-time data from pedestrians, vehicles and internet-enabled infrastructure; self-driving mail delivery vehicles; and powerful radar technologies. These were some of the research efforts discussed at the Contextual Robotics Forum, which brought the leading intelligent vehicle companies and researchers together on campus Oct. 27 to take stock of the developments and challenges in the space, highlight the university’s plans to roll out autonomous vehicle testing, and align research efforts. The University of California San Diego is taking the lead in intelligent vehicles, turning the campus into a living laboratory for self-driving cars starting with mail delivery in January. “At UC San Diego, we are not just educating undergraduates, we are not just doing great research, we also have to be the intellectual driving force behind how this region is moving in various areas, design being one and robotics being another,” said UC San Diego Chancellor Pradeep K. Khosla. While industry is initially focused on deploying vehicles on highways and terrain that is relatively easy to navigate, UC San Diego’s role is to answer some of the more challenging questions, said Henrik Christensen, director of the UC San Diego Contextual Robotics Institute. The first phase of that vision is mail delivery courtesy of autonomous carts. After that, Christensen envisions a self-driving shuttle transporting visitors to and from the Birch Aquarium to and from the parking lot, and eventually an autonomous vehicle service to move people from the planned trolley stops a mile away from campus and the UC medical centers, and take them to their final destination. Solving the self-driving car challenge is a unique and complicated engineering and social sciences puzzle. But this is not being done for the sake of learning and research alone. With 38,000 people killed in car accidents every year in the United States—93 percent of which are caused by human error—there is urgency to getting these vehicles on the road. UC San Diego is the ideal candidate for this challenge given its access to roads for testing, and expertise in areas including wireless and vehicle-to-vehicle communication, radar, user-centered design, cyber security and driver monitoring. Researchers, including Gabriel Rebeiz, Sujit Dey and Mohan Trivedi of UC San Diego, shared their work in this arena at the Forum, detailing how their radar, cloud-based data management and vehicle interface research will be incorporated into Christensen’s autonomous vehicle project. Rebeiz, a professor of electrical engineering, has designed a phased array radar system so powerful that it can replace light detection and ranging (LiDAR), a popular method of creating 3D maps of objects around autonomous cars. “Effectively, our job is to eliminate LiDar,” Rebeiz said at the Forum. This radar technology, as well as Dey’s Collaborative-Situational Awareness Map—which pulls data from all vehicles, pedestrians, and internet-enabled infrastructure in a set area and sends it to the cloud where it’s fused—will be tested and tailored through the autonomous vehicle living lab as well. The carts navigating around campus to the 13 defined mail drop spots will be run on algorithms developed at UC San Diego. While the university is shaping the technical future of intelligent vehicles, it’s not the only organization in the region working to make San Diego a hotbed of self-driving cars. The San Diego Association of Governments (SANDAG) championed an effort to get San Diego designated as one of 10 proving grounds for autonomous vehicles by the Department of Transportation, so vehicles will also be tested on state roads in Chula Vista and the I-15. Peter Thompson, a senior technology analyst at SANDAG, said one of the key points SANDAG highlighted in their pitch for this designation was the history of collaboration in San Diego between research institutions, industry and government organizations. The pipeline of qualified students coming out of UC San Diego and other local universities was a major factor as well. “We also highlighted Qualcomm and the global wireless hub of research and development we have here in San Diego, along with the workforce development pipeline here with some of the world’s leading universities feeding into those research and development environments in industry,” Thompson said. Xiaodi Hou, chief technology officer of TuSimple, a joint U.S.-Chinese company based here in San Diego that is developing low-cost commercial trucks that can drive autonomously on highways, echoed that sentiment. Christensen said UC San Diego recognizes the importance of the work, and plans to collaborate with local companies and institutions to ensure the right people are tackling the right problems.